The Oxford Reading Tree Traditional Tales series includes 40 of the best known stories from all over the world, which have been passed down for generations. They are a perfect introduction to different cultures, traditions and morals. 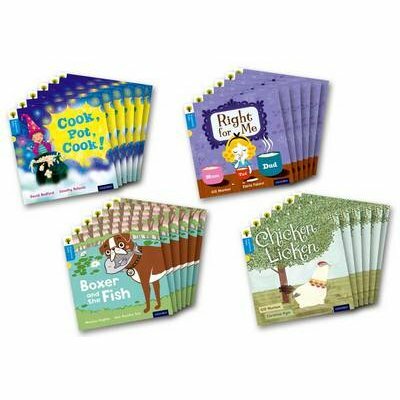 All the stories are carefully levelled to Oxford Reading Tree levels and matched to the phonics progression in Letters and Sounds, enabling your children to read the stories independently. There are four Traditional Tales titles available at Level 3: Cook, Pot, Cook! (based on The Magic Porridge Pot) Chicken Licken Right for Me (based on Goldilocks and the Three Bears) Boxer and the Fish (based on The Greedy Dog). Books contain inside cover notes to support children in their reading. Help with childrens reading development is also available at www.oxfordowl.co.uk. Each Mixed Pack includes one of each of the Level 3 titles listed above. The Class Packs include six of each of the Level 3 titles listed above.